Despite the fact that a great majority of the Hindu states of India demonstrate a preference for vegetarian and pescetarian food, it would be wrong to assume that the inventive recipes of Indian cuisine do not cater for meat-eaters. Last summer, online newspaper The Hindu reported that chicken is the second favourite animal protein in India, coming up closely behind fish and far ahead of the third and fourth rankings of mutton and beef. Chicken appears in a range of delicious dishes that vary from region to region, but one of the best methods of showcasing this tender meat is in the classic Indian curry. The word ‘curry’ originated from the Tamil word ‘kari’ which actually means ‘sauce’, and despite the range of consistencies a curry sauce can take, there’s no doubt it has very much become the iconic dish of India. Here in the UK we love a good curry and it is rare to find an aficionado of Indian food that does not have a particular, go-to recipe or at least a favourite order from their local take-away, for those nights when they are feeling a little too lazy to cook. 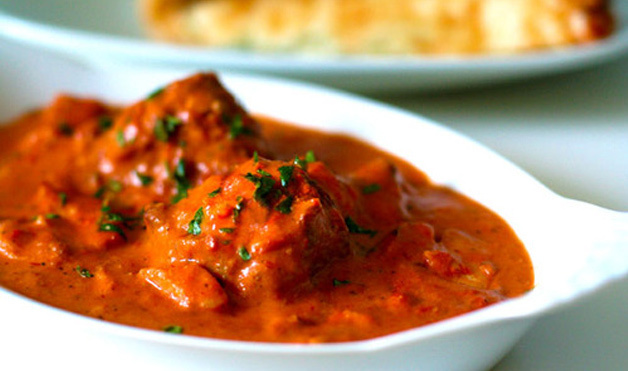 Whether you prefer a mild and creamy sauce or a tangy, tomato-based gravy, there is a chicken dish out there guaranteed to satisfy your curry cravings. Look to the recipes of North India for rich, buttery sauces and to the South if you enjoy the addition of coconut – both the flesh and the milk. Murgh makhani, also known by the tempting moniker ‘butter chicken’, is a comfort food classic of India and a favourite of the Punjab region. The meat is left on the bone and marinated in a thick yoghurt, flavoured with spices such as garam masala, ginger, coriander, cumin, chilli and turmeric. Butter is a key ingredient of the sauce which also includes fresh, chopped tomatoes, onions and garlic and cream or cashew paste is added for a luxurious texture. A Bengali speciality, murgh rezala is a chicken curry for those that love a creamy gravy. Following in the tradition of the Mugahl culinary preferences for rich and aromatic sauces, the chicken is slow-cooked in a cashew nut preparation, flavoured with spices and served up with a warm roti. Sali ma marghi is a traditional Parsi dish and a favourite for sharing with friends and family at New Year. This dish requires a tangy-on-the-tongue tomato sauce and is given a unique twist with a garnish of crispy, fried potato shavings. This chicken curry hails from the Chettinad district of Tamil Nadu and is the ideal choice for those that love to spice up their dishes with plenty of hot chillies. Preparing chicken Chettinad-style involves creating a paste out of roasted and dried red chillies along with coconut, cumin, fennel, poppy seeds, black pepper, coconut, onion and garlic. This tradition of cooking has a reputation for some of the spiciest curries in India. You can be sure to find tasty chicken recipes on offer at some of London’s best Indian fine dining restaurants – look out for elements of these classic dishes brought bang up-to-date with a contemporary twist.